"Overnight" products and "low frequency of change" are somewhat synonymous. Experienced caregivers will use the most absorbent diaper or brief (that fits well) to ensure no overnight leaks and excessive laundering of bed clothes. Family caregivers, seeking to lessen the frequency of changes, while maintaining caree skin health and dignity, will also tend to use super absorbent / overnight adult diapers and incontinence products. We consistently hear from customers looking for the "most absorbent product available" â€” which can be a bit of overkill. Overnight voids exceeding a cumulative 20 ozs of liquid would be unusually high. Typical overnight voids are normally within the 6 â€” 14 oz range, and all of our Parentgiving Picks here can hold well over 30 ozs of liquid, with the absorption champion Abena Premium Level 4 holding a whopping 120 + ozs. Leaks are usually driven by a poor fit, or gaps in how the product is applied, so we stress finding a good and comfortable fit that fits both caree and caregiver needs (fit, skin health, easy on and off, and monthly cost $). 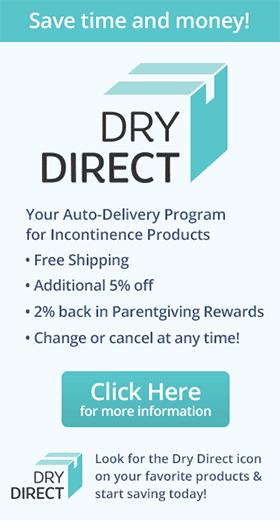 As with all incontinence products, the best solution is the right combination of fit, materials, and application. These picks ramp it up on fill material - lots of it - to make the fit bigger and bulkier. Each person is different, but we consistently hear of experienced family and professional caregivers making as little as three (3) changes a day when employing these super absorbent products. These latex free disposable pull-on diapers hold over a quart of liquid for uninterrupted sleep and maximum protection. Tearaway side seams allow for easy removal while Kufguards offer leakage protection. A high-tech, 3-part absorbent core for added dryness and neutralizing odor. Padded panels and stretch polymer maximize comfort while anti-leak cuffs improve containment.